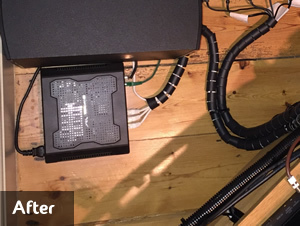 Smart ways to transform your nest of dusty unsightly cables. Give your Audio or Visual system the transformation it deserves with a new fresh look whilst also helping prolong the life of your cables and equipment. Using a range of cable management solutions “JMS AV” will organise and regroup all of your Audio & Video cables into an elegant easy to clean unit. 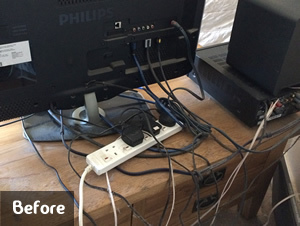 Cable tidying & clean up services. 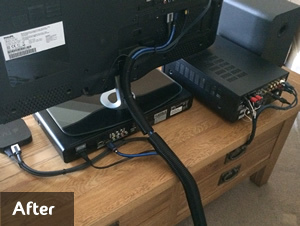 “Absolutely love my entertainment setup in my lounge but knowing that there was miles of untamed wires just out of sight annoyed me somewhat. 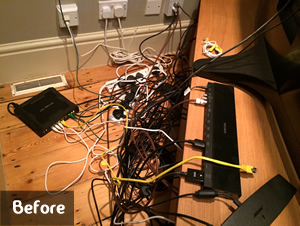 So very pleased with outcome of the work that Jerry from JMS AV has undertaken to sort the wires. Didn’t think it was possible that they could look the way they now do.